Isagenix fish oil is second-to-none, sourced from small fish in deep, unpolluted waters and then distilled to produce the most concentrated sources of DHA and EPA omega-3 essential fatty acids. 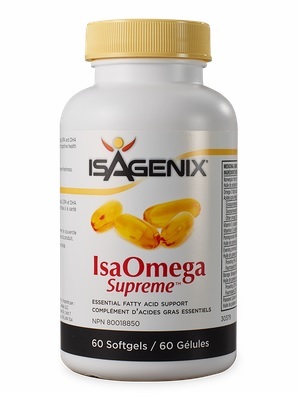 Each batch of Isagenix fish oil (called IsaOmega) is thoroughly tested for heavy metals, PCBs and dioxins. How Do I Buy Isagenix IsaOmega Supreme in Canada? RECOMMENDED: Sign up and Save (CA$22) — Sign up to the Isagenix autoship program to become eligible to have access to the cheapest wholesale prices. At the end of the checkout process you’ll be asked to set up your next month’s order. Autoship can be cancelled at any time, even after you take advantage of the cheaper prices on your first order! There are no locked in contracts of any sort. Plus, this gives you the opportunity to participate in the Isagenix business (this is 100% optional). Full Retail (CA$29.33) — If you prefer not to sign up and take advantage of the lower pricing, you can purchase the products at full retail price. This is not recommended as you can cancel autoship at any time. Your first order with IsaAxcess is covered by a product money back guarantee within 30 days. If you’re not completely satisfied with your Canadian Isagenix IsaOmega, send it back to Isagenix Canada for a refund!